Tangedco hall ticket 2016 for Field Assistant, Technical Assistant, Assistant Draughtsman test - tangedco.gov.in - Download TNEB admit card, Check Exam date. 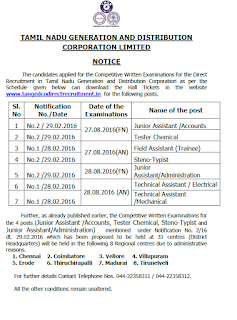 Tamil Nadu Generation and Distribution Corporation Limited (Tangedco) is going to conduct written test for the posts of Field Assistant, Technical Assistant, Asst. Draughtsman etc.. The written exam had been scheduled on below given dates. Selected candidates will be posted in their respective pay scales. The hall ticket of TNEB are going to be available for download. Those candidates who had applied, can download Tangedco Exam hall ticket from the direct link given below. The Hall Tickets for eligible candidates are available in the TANGEDCO‟s Website for downloading by candidates. No Hall Ticket will be sent by post. So, the candidates should watch TANGEDCO website ahead / before the scheduled date of examination. Downloading of Hall tickets for Competitive Written Examinations for the posts of Junior Assistant /Accounts ,Tester Chemical ,Field Assistant (Trainee) ,Steno-Typist ,Junior Assistant/Administration ,Technical Assistant / Electrical ,Technical Assistant / Mechanical to be held on 27.08.2016 and 28.08.2016. The tests will be held on following dates. You can check them from below given notice. 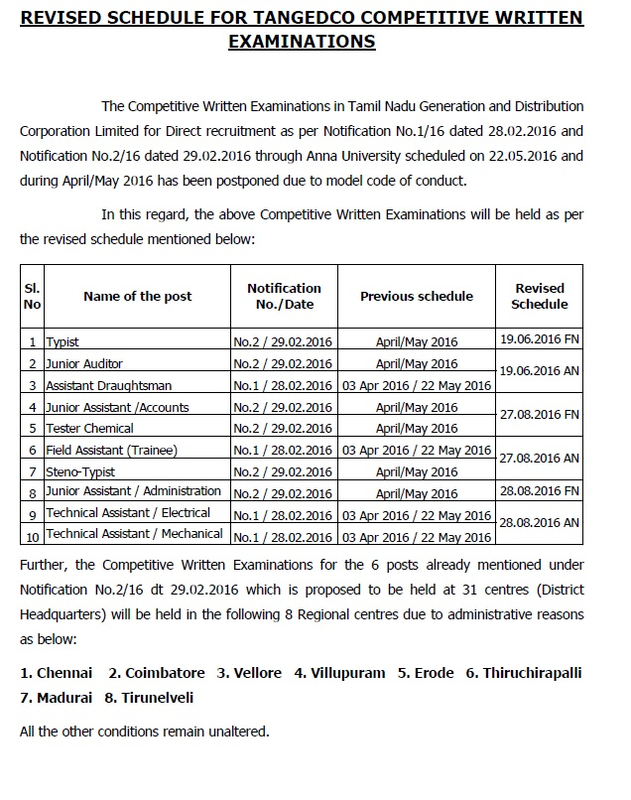 Tamil Nadu Generation and Distribution Corporation Limited is going to conduct written exam 03 April 2016 for Field Assistant, Technical Assistant (Electrical / Mechanical), Assistant Draughtsman posts. For that, hall ticket are going to be released 5-10 days before the exam. 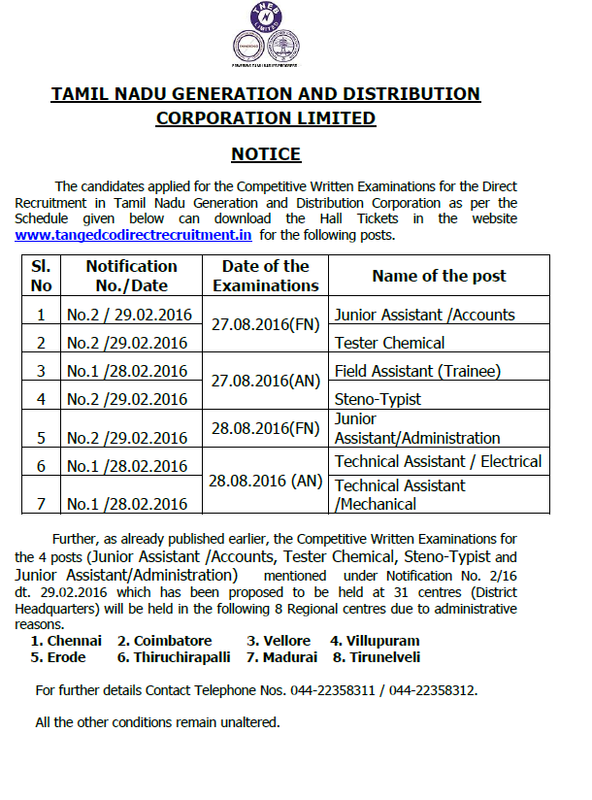 Tangedco exam date : 27 & 28 Aug 2016. 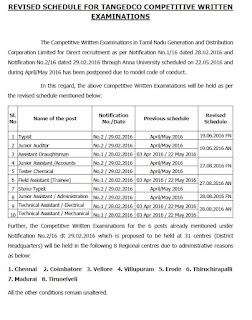 The Competitive Written Examination will be conducted as per “TANCET” norms by Centre for Entrance Examination / Anna University, Chennai-25. Candidates have to download TNEB hall ticket from the official website tangedco.gov.in via the direct link given below. 5 times against the no. of vacancies will be called for Interview which will be of 15 marks. reservation in the ratio of 1:5. The admit card of TNEB is going to be available in upcoming days. In order to download the hall ticket for Tangedco AE exam, candidates need to visit the direct link provided here (after release). It will take you directly to download page. Then candidates need to enter their details and click submit. Their TNEB hall ticket should be downloaded from there. Tangedco hall ticket release date: around 7-10 days before exam.